There's little information available on this front online, but from what I have been able to find, the club was founded in 1883 and has spent its entire history in local leagues, joining the Norfolk & Suffolk League in the aftermath of World War 2 before being placed in Section B of the Anglian Combination League when this formed in 1964 after a merger of the Norfolk & Suffolk League and the East Anglian League. 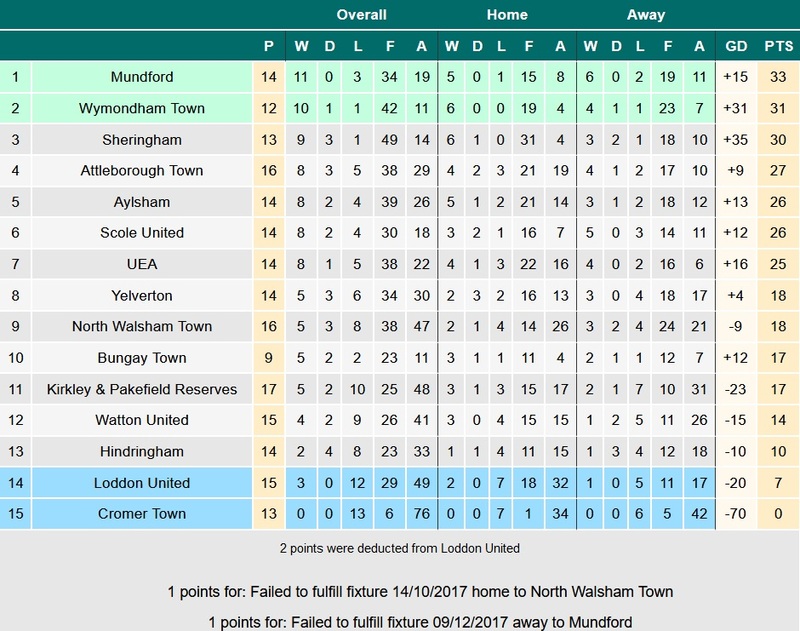 Despite some struggles in recent years (Wymondham Town almost folded in 2014), the club are currently in Division 1 of the Anglian Combination League, competing for promotion to the Premier Division. Other than this, the club notably played in the FA Cup for six seasons, from the 1950/51 season to the 1955/56 season. The only game they ever won in the competition was a 2-1 win at Cromer Town in their final season in the competition, before losing to Beccles in a replay in the 2nd Qualifying Round. I knew from the start that I was going up to visit my grandparents in Attleborough yesterday, but it wasn't until Friday that I knew my options would be very limited. Initially, I had been hoping to go somewhere like Walsham-le-Willows or Downham Town, but I was told I would have to stay very local to get to a game at all. With this in mind, my thoughts initially turned to Mundford, but as they were playing a struggling Cromer Town side, I thought the game would be farcical and not worth it, as much as I wanted to visit the ground (Mundford ended up winning 10-0, so my prediction seems to have been spot-on, unfortunately). I was then set on going to Attleborough Town for their game against Watton United, but I was somewhat reluctant as I knew there wasn't any football furniture at their ground. As such, when my grandfather said that, as far as he knew, Wymondham Town had a stand, I asked my dad to make the short drive there for their game against Sheringham. However, when we got to the ground, it turned out that there was no football furniture at all, just a clubhouse and a pitch. This was somewhat disappointing, but at this point I figured I may as well make the most of it and, after picking up a couple of programmes (one for my dad and one for me), I took a small amount of photos while waiting for kick-off. With it being elevated above the pitch - and hence a good vantage point - and being the only area of the ground with hard standing, my dad and I opted to stand in front of the clubhouse, with the initial idea being to go in at half-time for a hot drink (which we didn't end up doing). Looking at the table, it seemed reasonable to assume that this would be a close and competitive game between two strong sides, with the outcome either being a tight draw or one of the two teams suffering just their second loss of the season. 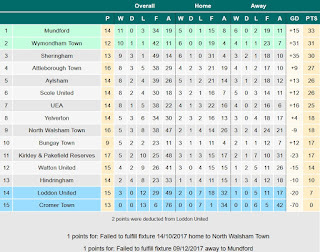 With both teams competing near the top of the league for promotion (with Wymondham in 2nd and Sheringham in 3rd going into the game), and with only two losses between them this season, I was expecting a tight, competitive game. Right from the kick-off, the latter proved to be true, with neither side holding back in the tackle and the game quickly becoming very physical and aggressive, to the point that I started to wonder if the two sides have some kind of history with each other, as there seemed to be a lot of bad blood between the two teams: for instance, Wymondham could have easily had Charlie Blake sent off within the first ten minutes, and come the end of the game I was surprised he had lasted the full 90. In any event, this approach to the game meant that clear-cut chances were few and far between in the opening fifteen minutes, with neither team looking particularly like scoring. However, after 17 minutes, Wymondham broke the deadlock, a cross into the box headed in from close range by Danny Pennell. Their lead was then doubled nine minutes later when an excellent through ball put Ashley Mitchell into the box, leaving him to calmly shoot past Chris Bird in the Sheringham goal. 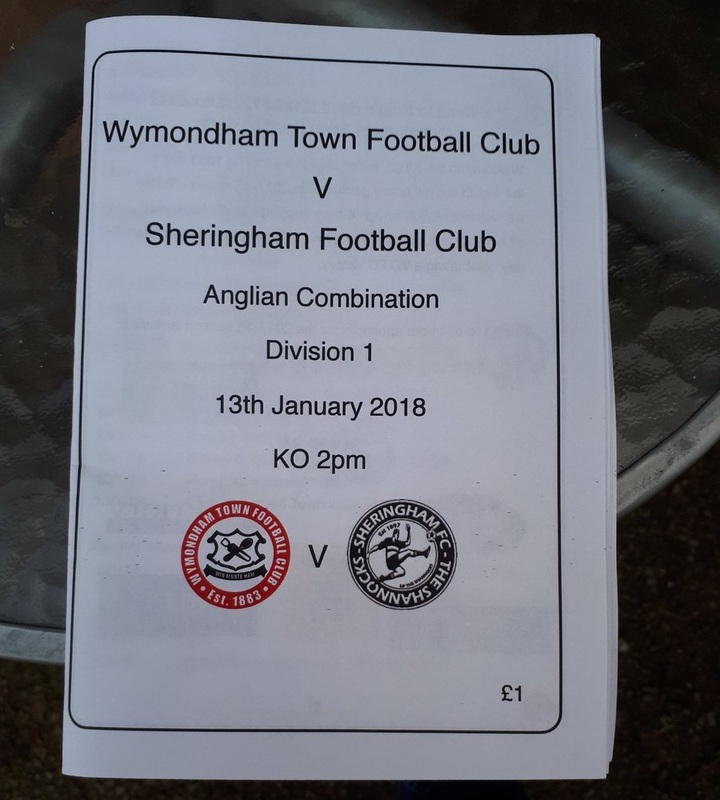 Sheringham started to push hard for a way back into the game, but were unable to make the most of their chances to do so. Their frustration was then compounded when, on 40 minutes, Wymondham's Aaron Nixon scored an outstanding goal, chipping the ball into the net from 35 yards out, much to the surprise of everyone in the ground; at Step 8, you definitely don't expect to see someone able to score like that, even if inept goalkeeping definitely contributed to it (Bird was more or less on his line, yet was unable to do anything to stop the ball from dipping behind him and into the net). While this should have seen Wymondham comfortably clear, and Sheringham out of the game, the away side were seemingly woken up by this goal and cranked up the pressure, taking just four minutes to pull one back: a free kick was played into the box and Ben Boyce had a free header from which to score. 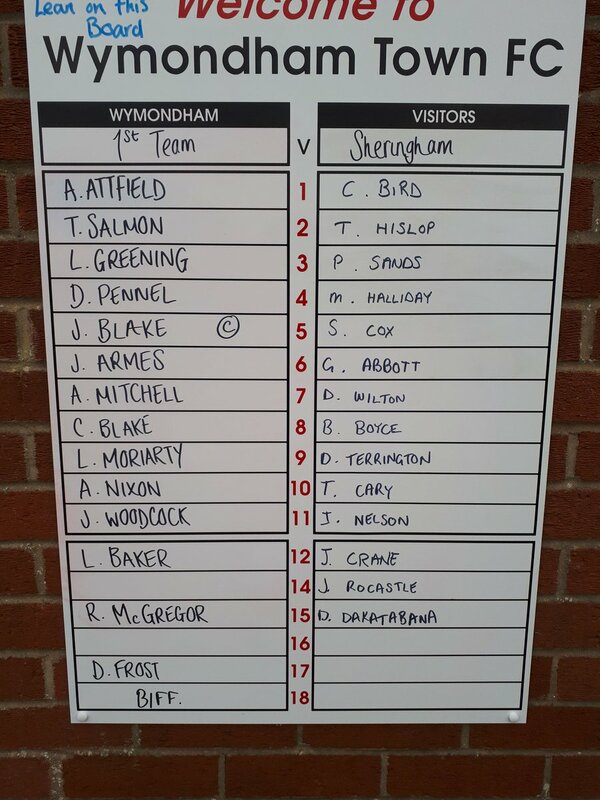 The situation continued to improve for Sheringham during added time when Wymondham's Charlie Blake was sin-binned for persistent dissent. 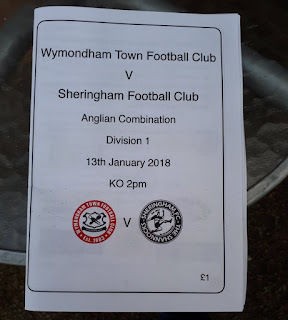 As for the second half, Sheringham started on the front foot, having been gifted a way back into the game through Boyce's goal and the man advantage for the first ten minutes of the half. 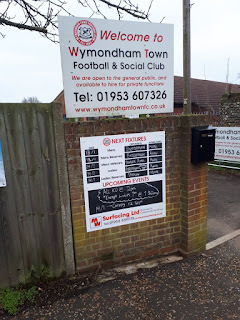 However, despite chance after chance after chance throughout the half, I would be hard-pressed to say that they ever actually looked like scoring, as their efforts were hindered either by wasteful finishing or by overly-slow build-up play allowing Wymondham to bring bodies back to defend with. 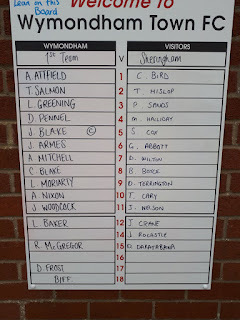 In fact, even though Sheringham had the vast majority of the chances in the second half, Wymondham had the best chance after around 75 minutes, Ashley Mitchell set through one-on-one but having his shot well-saved by Bird in the Sheringham goal (his first save of the entire game, I seem to recall). In the end, the game finished 3-1 to the home side, with the second half ultimately being more notable for some, shall we say, lackluster refereeing, the most notable mistakes being that he missed a blatant back pass and a blatant handball in the box; other than this, he just generally didn't control the game enough, in that he didn't book or send off anyone to curb the increasing physicality of tackles in the second half, something which undoubtedly hindered proceedings. Overall, for my first trip below Step 6, it was a better game than I expected, but it did pretty much completely peter out during the second half, which was a shame really as the first half had been a good contest despite its physicality. Still, it could have been a whole lot worse, I suppose. On the whole, while I can't say this was where I hoped or expected to end up for my first groundhop of 2018, it was a decent start to the year, as well as being decent for the last game I'll be watching before heading back to University this coming Friday. It feels strange to be saying this for the second groundhop in a row, but King's Head Meadow is now the most basic ground I've ever visited, something which is perhaps not surprising considering this was two levels lower than Step 6. The only area of hard standing is in front of the clubhouse which, as I said above, is elevated above the pitch. There is no cover of any sort at the ground, while the rest of the standing at the ground is little more than grass banks. The area in front of the clubhouse has a proper perimeter fence, but the rest of the pitch is only enclosed by a rope. There are also three floodlight pylons in front of the clubhouse, but none of these were in use, though whether this is because they don't work or not I can't say for sure. Overall, though it is a very basic ground, it is sufficient for the club's needs, and I can't help but feel that it is probably slightly better than the typical set-up at Step 7 or below (there are some notable exceptions to this, but most grounds from Step 7 downwards are little more than pitches from what I've gathered).